What Form Will The Great Confiscation Take — And How Can We Prepare? For what seems like decades, people have been warning that the next time some over-leveraged corner of the financial system implodes, bank and brokerage accounts will be either confiscated by desperate governments or lost during the resulting chaos. In bankruptcy of your bank, broker or fund, you can find your assets in the majority of cases are backing the liabilities of the entity in front of yourselves. This is why you must act to protect yourself. No one in this financial world is going to do it for you, and few will have the courage to recommend you escape Street Name. You can wake up one day and find out that your investments are gone. The insurance programs will function as long as the incidents of bankruptcy are isolated events. In a systemic collapse the insurance funds are not capitalized to meet the potential obligations. 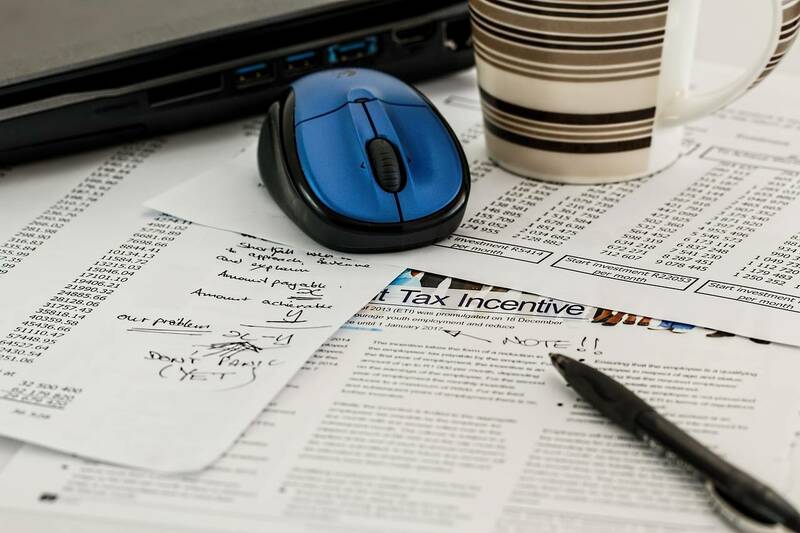 The guarantor you are relying on will have to be bailed out. Anyone advising you to stay with the Street Name option is a babbling idiot not interested at all in your welfare. In street name the inferred ownership is the broker or bank, not you. In Direct Registration and Certificate form, the distinct ownership is you. In 99.9% of the cases of retirement accounts the answer is you are in Street Name. How are your securities held? Do you even know? I dare you to ask! Do you know what your broker’s capital ratio is? Find out as that number is the order of magnitude at which your broker is gambling on with primarily your money. I dare you to ask. This time around those investors that are too lazy to consider protecting themselves will be demolished. How would you like your gold shares at $3500 gold, outperforming gold, and one morning you wake up to having nothing anymore? You now are behind the back burner in a bankruptcy situation with any fiduciary. The system and their minions will do everything to keep you trapped in Street Name. Articles will be published trying to put you back to sleep on this issue. In that interim period between the crisis and the time the IMF can react, central banks will be paralyzed. They’re likely going to lock down the system. When I say lock down, they’ll start with money market funds. I can’t think of a greater misnomer than the money market funds. People think that money market funds are money. They’re not money; they’re mutual funds regulated by the SEC. People think they can just call up their broker, sell to the money market fund and the money’s in my bank the next day. That will not be true in this crisis because everyone will be doing the same thing. That is what happened in 2008 when Ben Bernanke and Hank Paulson went to the White House and said to the President that the system’s melting down and he must act. That was such a shock then, that when it happens again they’re not going to give you your money. They’re going to lock it down. The problem is that when it is spreading you can’t just lock down part of the system. If you lock down money market funds, people are just going to take their money out of the banks. Then you’re going to have to close the banks. Then people are going to sell their stocks, then you’re going to have to close the stock market. Every time you shut one path to liquidity, people are going to turn to another path. It happened in part in 1914, 1931, 1933 and to gold in 1971. There’s no precedent for a total freeze but we’re getting closer to that point. The question is, how do you protect yourself against that? There’s only so much you can do. I don’t recommend running down and pulling all your money out of the bank. I would not have more than the insured amount, which in the U.S. is $250,000. You can spread it between your selected banks so that each is backed and insured up to the limit. In the world described, the dollar price of gold will approach the $10,000-level if not much higher. But when all of this begins to play out, you’re not going to be able to get gold. Because of this, gold and silver need to be in physical form, in safe storage, and a non-bank. Putting it in a safety deposit box in a bank is troublesome because by the time you want it the most, that will be when the banks are going to be closed. So what’s difficult to expropriate? It’s impossible to expropriate one’s skills, experience and social capital. These are intangible forms of capital and so they cannot be confiscated like gold, currency, land, etc. Secondly, it’s very costly for the state to maintain the productive output of real property it has confiscated. Guards must be posted, sabotage repaired, and the immense difficulties of coercing a rebellious populace to continue working what they once owned for the benefit of the state and its privileged Elites must be solved and paid for. As a general rule, whatever the super-wealthy own will be protected from expropriation. Private real property is the foundation of the Elites’ wealth, and while the land of debt-serfs may well be confiscated for back taxes (the wealthy will buy exemptions from rising taxes), those who own land and buildings free and clear constitute a political force to be reckoned with. It’s easy, as the world’s zombie economies just keep shuffling along, to start assuming that the current system will endure forever. That would be wrong, and almost certainly the above warnings will someday seem prescient. All the more reason to forget about timing, and keep buying real assets. ONE OF THE axioms of technological progress is that it democratises entertainment, distributing delights to the masses that were once reserved for the elites. More high-quality entertainment is available to more people on the planet than ever before. At the same time individuals across the globe can find an audience much more easily than was previously possible. The ability to access whatever entertainment people want digitally and on demand has transformed diversions in societies both rich and poor, changing the lives of billions. Even more remarkably, mass entertainment today can be tailor-made, not one-size-fits-all. There is something for everyone and at any time that suits. At the beginning of the day in New York the dreary subway ride to work is filled with music. In Tokyo the journey home from the office is a time to devour manga on a mobile phone. In the evening in a rustbelt city outside Beijing, workers who cannot afford a night out may tune into broadcasts live-streamed by their fellow citizens. Billions of people can choose from a large range of mobile games at any time. In his book “The Long Tail”, published in 2006, Chris Anderson, a technology writer who used to work for this newspaper, observed that the internet has opened up potential markets for any niche product, no matter how quirky. A decade on, any star on YouTube can attest to that. From a child unboxing toys to the delight of toddlers around the world to a puckish Swedish gamer with millions of teenage fans, running one’s own virtual TV channel online can be worth tens of millions of dollars to a lucky few. And yet as a business, entertainment has in some ways become less democratic, not more. Technology is making the rich richer, skewing people’s consumption of entertainment towards the biggest hits and the most powerful platforms. This world is dominated by an oligarchy of giants, including Facebook, Google, Amazon, Netflix and Disney (as well as Alibaba and Tencent within China’s walled ecosystem). Those lacking sufficient scale barely get noticed. Paradoxically, enabling every individual and product on the planet to find a market has made it next to impossible for the market to find them. Consumers generally favour whatever they find on their mobile screens or at the top of their search results. The tail is indeed long, but it is very skinny. Being able to produce a blockbuster hit has become even more valuable than it used to be. It turns out that everyone wants hits—the more familiar the better, says Derek Thompson, author of a book entitled “Hit Makers”. Despite the availability of entertainment specially tailored for each individual, people still crave experiences they can share with others. What they want most is what everyone else wants. The same technological tools that have atomised entertainment have also made it easier to aggregate audiences. Rankings of the most popular downloads or streams are self-reinforcing. 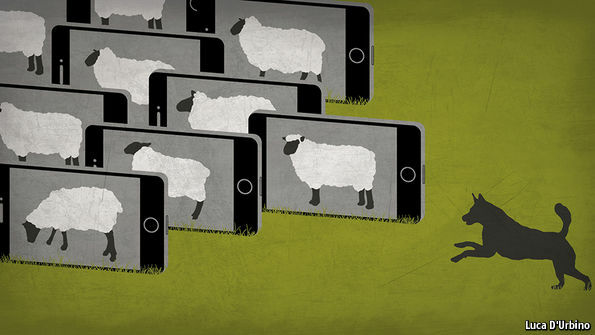 Recommendation algorithms steer people to what others like them have also watched or listened to. The social-media impact of the biggest hit in any genre is dramatically greater than that of any lesser hit, thanks to network effects. It seems clear now that the future of mass entertainment is not “selling less of more”, as Mr Anderson put it, but selling a lot more of less. The film business illustrates the point. Of the thousands of films released worldwide in 2016 (including well over 700 in America alone), the top five performers at the box office were all made by Disney. The 13 films the company released last year, plus remaining business from “Star Wars: The Force Awakens”, accounted for one-fifth of total film revenue worldwide. Disney has focused on big-event films with iconic characters and storylines that have global appeal (and that fuel its unparalleled businesses in consumer-product licensing and theme parks). Only a few years ago the big studios would typically aim for 20-25 films apiece to provide a margin for error. Some still do, but Disney’s more focused approach, investing almost exclusively in blockbusters, is paying off with a much higher rate of return. When Bob Iger took over as CEO in 2005, he felt sure that, in an era of proliferating content, big brands would become more valuable—the bigger the better. The company went on to spend $15.5bn to amass an arsenal of content brands that became the envy of the media world: Pixar Animation Studios, Marvel Entertainment and, in 2012, Lucasfilm, maker of “Star Wars”. “We saw in each one of those a brand that would matter in a new world order,” says Mr Iger. The blockbuster effect has been even more striking on the digital platforms that were supposed to demonstrate the benefits of the long tail. On iTunes or Amazon, the marginal cost of “stocking” another item is essentially zero, so supply has grown. But the rewards of this model have become increasingly skewed towards the hits. Anita Elberse, of the Harvard Business School, working with data from Nielsen, notes that in 2007, 91% of the 3.9m different music tracks sold in America notched up fewer than 100 sales, and 24% only one each. Just 36 best-selling tracks accounted for 7% of all sales. By last year the tail had become yet longer but even thinner: of 8.7m different tracks that sold at least one copy, 96% sold fewer than 100 copies and 40%—3.5m songs—were purchased just once. And that does not include the many songs on offer that have never sold a single copy. Spotify said in 2013 that of its 20m-strong song catalogue at the time, 80% had been played—in other words, the remaining 4m songs had generated no interest at all. Music-streaming services have not been around for long enough to allow a definitive assessment of their market impact, but as they attract more casual music fans (as opposed to deeply knowledgeable nerds), the hits can be expected to benefit. In 2015 the top 1,000 songs were streamed 57bn times in America, accounting for 18.8% of the total volume of streams, according to BuzzAngle Music; last year the top 1,000 songs accounted for 92bn streams, or 23% of the total. 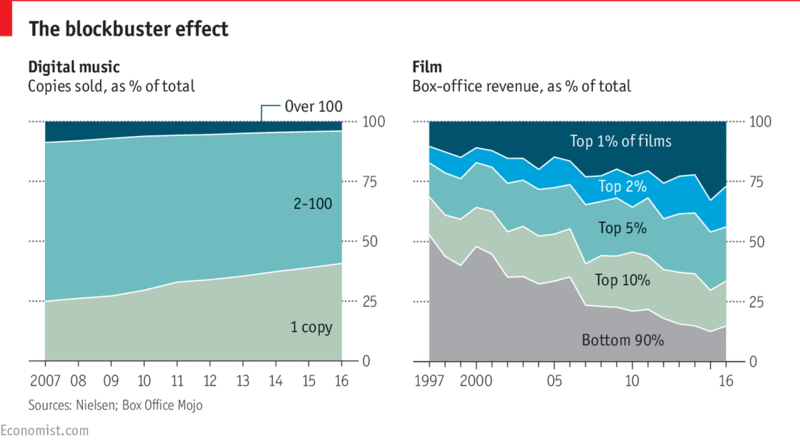 The economics of blockbuster films, which are shown in cinemas, might seem different from those of blockbuster music and TV streaming, but in the digital age they and other entertainment products have much in common. There is almost no limit to the supply of entertainment choices in every category, but people’s awareness of these products and their ability to find them is constrained by the time and attention they can spare. Overwhelmed by the abundance of choice, they will generally buy what they are most aware of. The algorithms used to make recommendations, offered by many sites, reinforce this trend: they push consumers to what is popular rather than send them off to explore obscure parts of the tail. This helps explain why Netflix, which specialises in supplying film and video on demand, has repeatedly bet big on event television, from its hit “The House of Cards” to the lavish production of “The Crown”, about Britain’s royal family. It has also spent hundreds of millions of dollars to secure the rights to Disney films. It still views itself as a long-tail company, but although it spends billions of dollars to serve lots of different market niches, especially geographical ones, subscribers generally make a beeline for the top 50 or so. At the same time a lot of entertainment has been commoditised as the barriers to production and distribution have come down. An item further down the long tail may rarely be chosen, but is not “scarce” in the sense that it can command a premium; on the contrary, a relatively obscure item is worth very little. One reason is that the internet leads consumers to expect most things to be free, especially content without a brand name. Second, consumers believe (rightly) that there is not much difference between most of the obscure items on offer. And third, they reckon (also usually correctly) that those items have cost hardly anything to produce, so they are almost worthless. Conversely, consumers will pay a premium for famous brand names. This is partly to do with the way search engines and social platforms work. Facebook, YouTube and Snapchat readily deliver huge amounts of entertainment free. At the same time they offer individual performers, artists and writers a greatly increased chance of finding some sort of audience, be it next door or halfway across the world. On average, 60% of the viewers of an individual creator’s YouTube channel live outside the country where the artist is based. This may be a fairer way of achieving stardom than in the pre-internet era, when traditional media companies picked winners and pushed them to the public via narrow distribution channels. Likewise, the 710m people online in China have discovered another independent path to fame, which is likely to spread to other parts of the world. Live-streaming has helped millions of Chinese internet users, many of them in rural villages or dreary industrial towns, personalise mass entertainment for each other. In such ways, with lower barriers to finding an audience (whether of one or many), millions of people around the world are using the internet as a lottery ticket to stardom. It is still a very long shot, but in theory the opportunity is now available to everyone. That translates into more entertainment of all kinds being produced and consumed than ever before. On the whole, though, the rewards of the digital economy accrue mostly to the big platforms and media companies. Eric Schmidt, the executive chairman of Alphabet, Google’s parent, has said that his company’s thinking has been greatly influenced by the long tail; but he has also acknowledged that most of the money is to be made in the head. The enduring dominance of the blockbuster has implications for the way consumers will be entertained for decades to come. Global competition for their attention, and their wallets, will bring about more mega-mergers like the one proposed between AT&T, a telecoms and pay-TV firm, and Time Warner, one of Hollywood’s greatest content creators. The $109bn offer indicated that AT&T felt the need to own great content to differentiate itself in the market. Likewise, it hinted at an uncertain future for content companies that cannot make sure they have an audience. For now, the competition among studios and video programmers is delivering more high-quality television for everyone than ever before, but it is also stoking fears of a collapse to come. This report will examine the proposition that the world may be getting close to peak TV. The best time to gain (or lose) audience—and to challenge the dominance of an established platform—is when technology makes a leap. That is why media, gaming and tech companies are investing billions in virtual reality and augmented reality. Such technologies can change the way that people experience storytelling and persuade them to suspend disbelief. James Cameron showed with his superb 3D imagery in “Avatar” how a leap in visual technology can create an outsized blockbuster. Now Disney is racing with other studios and tech giants to come up with the next leap, alternative realities. This report will argue that the most promising of these technologies are still far from ready, though many people will take to lesser, cheaper forms of them, such as those they can experience on their smartphones. Between the avalanche of digital entertainment and the still-distant promise of alternative realities, there is still a huge market for experiencing something real in person. The few hits that have captured the public imagination command a hefty premium. From “Hamilton” on Broadway to the mixed-martial arts combatants in the Ultimate Fighting Championship, people will pay thousands of dollars for the privilege of being there, even though they can experience the same thing or at least hear the same songs in digital form for a small fraction of the price. For the majority who must consume entertainment remotely, most of the battles are still about screens, be they the size of a smartphone or half a wall, and about minutes of attention within particular apps. But although consumers seem to have a dizzying array of choices, most of them do not take full advantage of them. What they pick is increasingly determined by the algorithms driving this competition, and those algorithms mostly send them straight to what everyone else is consuming. Blockbusters are the safe bet. Years too late, the fund tells the truth about Athens and bailouts. Now they tell us. The International Monetary Fund released a set of reports this week on Greece’s bailouts in 2012 and 2015. The verdict: Greece can’t be fixed by foreign technocrats bearing cash until Greek politicians, supported by their voters, elect to fix themselves. The belated awakening sets the stage for another Greek crisis, perhaps as early as this summer. Not that anyone should be surprised. It’s been clear for years that Greek voters don’t have the stomach for major reforms. They reminded creditors of their views in January 2015 when they elected the far-left euroskeptic Syriza party of Alexis Tsipras. As if to underline the point, Mr. Tsipras keeps trying to prosecute for treason Andreas Georgiou, the government statistician who first fixed Athens’s fiddled books and exposed its fiscal crisis in 2010—as if Greece’s only mistake was to follow European accounting rules. That reality seems to have been lost on Berlin and other creditors, who have repeatedly tried to pretend that maybe reform would be possible anyway under the auspices of a technocratic bailout memorandum. The IMF is now saying this strategy is exhausted. The fund’s report on Greece’s 2012 bailout notes that Athens managed briefly to bring its finances into line with targets via deep spending cuts and steep tax hikes. Yet neither the IMF nor anyone else prevailed on Greece to implement the supply-side reforms, such as privatizations and pension overhauls, that creditors keep demanding. So growth has frequently missed targets and crises recur whenever investors get nervous at signs Athens is reneging on its deals. The IMF sensibly refused to join the 2015 bailout, amounting to €86 billion ($92.03 billion). But Berlin continues to insist the fund must eventually sign on to the deal because Germans don’t trust Brussels to impose reform discipline on Athens. Other creditors agree, notably the Netherlands, where Finance Minister Jeroen Dijsselbloem warned Wednesday that the IMF’s withdrawal could scupper the bailout. With the IMF absenting itself, those governments will have to decide whether to continue unlocking tranches of that package, including money Athens will need to avoid defaulting on debt repayments this summer. Technically this is a difference of opinion about what level of fiscal surplus and debt relief is manageable for Athens. Germany, the Netherlands and other EU creditors demand that Greece achieve a primary budget surplus of 3.5% of GDP and wait for several years to negotiate more debt relief. 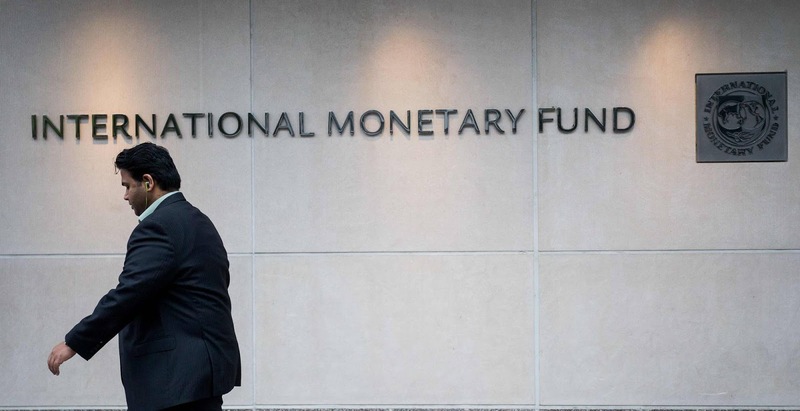 The IMF says those targets are implausible, to put it kindly, and will participate in the new bailout only if creditors accept a surplus of 1.5% of GDP and immediately forgive some of a debt burden amounting to 180% of GDP. But the real question is whether any economic forecasts and budget assumptions matter when nobody wants to address political reality. Dutch, German and other Northern European voters have to decide how much they’re prepared to subsidize an unreforming Greece for the political goal of keeping the eurozone intact. With elections this year in several creditor countries, especially the Netherlands and Germany, Europe may finally get the crisis it has needed all along: the moment when European taxpayers vote on what they’re willing to pay to preserve the currency bloc. As for Athens, it’s a shame that the country that gave us the concept of tragedy must learn anew how often it is self-inflicted. The IMF’s reports are a reminder that the remedy for Greece’s agonies lies in Greek hands. While tax reform is definitely coming, a final bill is still a long way off, and a 2017 effective date is looking less likely. What’s a word worth? If the word is “phenomenal” and it’s uttered by Donald Trump, apparently $175 billion. That’s how much the value of U.S. stocks increased on Thursday, according to Wilshire Associates’ calculations, after the president used that word to describe the tax plan that, he said, his administration would bring forth “ahead of schedule.” The ascent continued on Friday, adding another $100 billion to shareholders’ paper wealth and a total of $225 billion for the week, as the Standard & Poor’s 500 index, the Dow Jones Industrial Average, and the Nasdaq Composite all ended at records. For the financial markets, the week’s swirl of bad news for the Trump administration, from the rejection of the reinstatement of its travel ban from seven mainly Muslim nations to Kellyanne Conway’s ethics gaffe in touting Ivanka Trump’s “stuff” after Nordstrom in Your Value Your Change Short position (ticker: JWN) decided to discontinue carrying the latter’s fashion items, hardly mattered. The devil is, of course, in the details, and they involve some hellish trade-offs. “Will [the tax proposal] be the Ryan plan that includes a border adjustment tax, or will that be left out and we’ll get clean tax cuts at the expense of a much higher deficit?” wonders Peter Boockvar, chief market analyst at the Lindsey Group. “That distinction is very important because if it’s the former, it won’t be so ‘phenomenal’ for those companies that import a large portion of the cost of goods sold if the dollar doesn’t rally by the same extent as the tax,” he continues. That would hit retailers especially hard, but the strength of those stocks suggest there won’t be a border adjustment tax, or BAT. However, Boockvar believes that Trump backs the plan from House Speaker Paul Ryan, with some tweaks. Orrin Hatch, the octogenarian Finance Committee chairman, “has made it clear that there are huge unresolved issues,” says Valliere, including the BAT, debt deductibility, caps on individual exemptions, and abolishing the estate tax. While tax reform is definitely coming, a final bill is still a long way off, and a 2017 effective date is looking less likely, he concludes. Yet, as the action late last week suggests, the equity markets are more than willing to give the new administration the benefit of the doubt. Something’s coming, even if we don’t know what or when. And that seems good enough to bid stocks higher, especially compared with the competition. Particularly when part of that competition is what is called in polite company high-yield bonds—or junk bonds by anybody else. Last week, the iShares iBoxx $ High Yield Corporate HYG in Your Value Your Change Short position exchange-traded fund (HYG) hovered near its 52-week high. At that price, the popular junk ETF yielded a hair under 5.25%, which, as I recall, is what my grandmother’s passbook savings account paid way back when (though without a free toaster). While the markets mull the matter of future fiscal policy this week, they will ponder the course of monetary policy. Federal Reserve Chair Janet Yellen makes her semiannual trek to Capitol Hill to testify on the state of the economy, starting with the Senate on Tuesday, Valentine’s Day. There is little love lost between the Republican-led Congress and Yellen, whom Trump has said he’d like to replace when her term expires early next year. There already are two vacancies on the Fed’s Board of Governors, with a third opening looming, after Gov. Dan Tarullo on Friday announced plans to step down in April. At the last “live” Federal Open Market Committee meeting in December, the Fed indicated that it expected three increases—each of one-quarter point—in its federal-funds target rate over the course of 2017. Assuming that the panel stands pat at the March 14-15 meeting, as the fed-funds futures market expects, that points to hikes at the June, September, and December confabs. But the futures market has priced in only two moves, the first in June and the second in December (unless the FOMC breaks precedent and imposes an increase at the November meeting, which isn’t supposed to be a “live” one with a scheduled press conference). The Trump fiscal package surely will be a subject of the Capitol Hill inquisition this week, even though neither Yellen nor her questioners will know what’s in it or when it’s coming. The possible impact of the president’s proposals also enters into the formulation of monetary policy, even though it remains imponderable at this point. A more esoteric matter for Fed watchers will be the central bank’s balance sheet, which has become the subject of increased discussion of late. The Fed’s assets ballooned to $4 trillion in the wake of the financial crisis, nearly five times its pre-crisis size. Critics had contended that this expansion would result in hyperinflation. Instead, it has mainly pumped up asset prices. The Fed had planned to normalize its balance sheet whenever the crisis had passed, which it surely has, with the stock market setting records. And then the plan was to let maturing securities run off, rather than selling them outright. “We believe that there is a sense of apprehension within the Fed with regard to moving too quickly to start reducing the size of the balance sheet, given that markets have shown much greater sensitivity to that process—judging by the infamous taper tantrum in the summer of 2013—than for the more orderly and tightly scripted process of gradual rate increases so far,” says Anthony Karydakis, chief economic strategist at Miller Tabak. Markets are supposed to climb a wall of worry. Now, however, they continue to levitate on expectations of positive, pro-growth fiscal policies and continued accommodative monetary policies. As for the Fed, the uncertainties are relatively slight. But as “phenomenal” as the Trump tax plan may turn out to be, it’s a long way off at best. Stop me if you’ve heard this one before. After a long spate of easy money, seemingly high-returning investments burgeon in popularity. Even if they’re rather opaque, their credulous but happy investors don’t mind, as long as the returns keep coming. Then, as the tide of easy money recedes, it’s apparent who has been swimming naked, to use Warren Buffett’s famous metaphor, and—to cite George Costanza’s equally famous observation—who has been subject to shrinkage. It was after the financial crisis burst open that Bernie Madoff’s Ponzi scheme fell apart. Prior to that, many eminent financial institutions eagerly fed clients’ cash into Madoff’s funds without asking too many questions, as long as the returns came like clockwork. And those returns were just too regular to be true, coming without fail as the Fed steadily tightened policy from 2004 to 2007 and even after the mortgage bubble went bust afterward. Meanwhile, the biggest and best-run of the lot features all kinds of curious accounting, including earnings up just 2.9% in the third quarter while assets soared 49% from a year earlier. Its business includes sales of bundles of real estate loans, with 40% to 50% going to related entities, which typically raises red flags. Disclosure is vague and shifting, and the luxury property ventures aren’t selling, but relationships matter more—as was the case with many of Madoff’s investors. The Wild West atmosphere of Chinese investing is nothing new, of course. What’s different now is that the People’s Bank of China has been tightening its monetary policy, including engineering an uptick in its key money-market rate. Research firm BCA notes that repurchase-agreement transaction volumes in the interbank market also have dropped since late last year. Along with regulators’ curbing of banks’ wealth management products and off-balance-sheet items, these actions “underscore the determination to rein in excesses in the banking sector,” BCA adds. That could be viewed as the domestic counterpart to the PBOC’s actions to prop up the yuan in the face of capital flight. As Kopin Tan writes in the Streetwise column, that has drained China’s foreign-exchange reserves to below the $3 trillion mark. The capital outflow has slowed as Chinese authorities have stiffened restrictions on taking money out of the country. But it seems that rich Chinese want to move their funds before the deluge, as the title of Stevenson-Yang’s report suggests. What will you do when terrorists attack, or U.S. friction with some foreign power turns into a military confrontation? I don’t mean in your personal life, where you should keep calm and carry on. I mean politically. Think about it carefully: The fate of the republic may depend on your answer. Of course, nobody knows whether there will be a shocking, 9/11-type event, or what form it might take. But surely there’s a pretty good chance that sometime over the next few years something nasty will happen — a terrorist attack on a public place, an exchange of fire in the South China Sea, something. Then what? After 9/11, the overwhelming public response was to rally around the commander in chief. Doubts about the legitimacy of a president who lost the popular vote and was installed by a bare majority on the Supreme Court were swept aside. 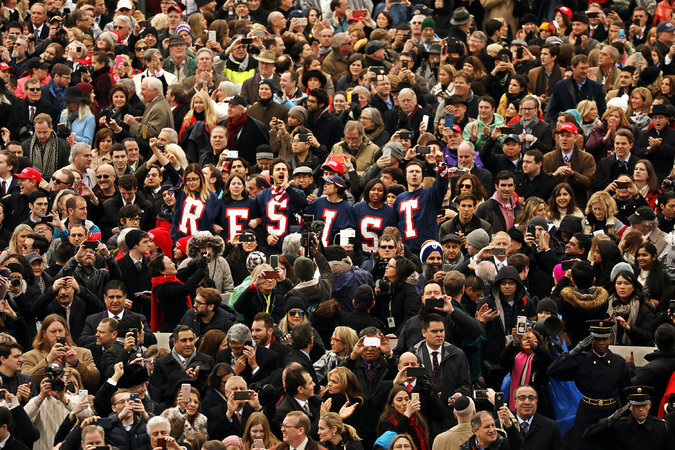 Unquestioning support for the man in the White House was, many Americans believed, what patriotism demanded. The truth was that even then the urge toward national unity was one-sided, with Republican exploitation of the atrocity for political gain beginning almost immediately. But people didn’t want to hear about it; I got angry mail, not just from Republicans but from Democrats, whenever I pointed out what was going on. Unfortunately, the suspension of critical thinking ended as such suspensions usually do — badly. The Bush administration exploited the post-9/11 rush of patriotism to take America into an unrelated war, then used the initial illusion of success in that war to ram through huge tax cuts for the wealthy. Bad as that was, however, the consequences if Donald Trump finds himself similarly empowered will be incomparably worse. We’re only three weeks into the Trump administration, but it’s already clear that any hopes that Mr. Trump and those around him would be even slightly ennobled by the responsibilities of office were foolish. Every day brings further evidence that this is a man who completely conflates the national interest with his personal self-interest, and who has surrounded himself with people who see it the same way. And each day also brings further evidence of his lack of respect for democratic values. You might be tempted to say that the latest flare-up, over Nordstrom’s decision to drop Ivanka Trump’s clothing line, is trivial. But it isn’t. For one thing, until now it would have been inconceivable that a sitting president would attack a private company for decisions that hurt his family’s business interests. But what’s even worse is the way Sean Spicer, Mr. Trump’s spokesman, framed the issue: Nordstrom’s business decision was a “direct attack” on the president’s policies. L’état, c’est moi. Mr. Trump’s attack on Judge James Robart, who put a stay on his immigration ban, was equally unprecedented. Previous presidents, including Barack Obama, have disagreed with and complained about judicial rulings. But that’s very different from attacking the very right of a judge — or, as the man who controls 4,000 nuclear weapons put it, a “so-called judge” — to rule against the president. Never mind the utter falsity of the claim that bad people are “pouring in,” or for that matter of the whole premise behind the ban. What we see here is the most powerful man in the world blatantly telegraphing his intention to use national misfortune to grab even more power. And the question becomes, who will stop him? Don’t talk about institutions, and the checks and balances they create. Institutions are only as good as the people who serve them. Authoritarianism, American-style, can be averted only if people have the courage to stand against it. So who are these people? It certainly won’t be Mr. Trump’s inner circle. It won’t be Jeff Sessions, his new attorney general, with his long history of contempt for voting rights. It might be the courts — but Mr. Trump is doing all he can to delegitimize judicial oversight in advance. What about Congress? Well, its members like to give patriotic speeches. And maybe, just maybe, there are enough Republican senators who really do care about America’s fundamental values to cross party lines in their defense. But given what we’ve seen so far, that’s just hopeful speculation. In the end, I fear, it’s going to rest on the people — on whether enough Americans are willing to take a public stand. We can’t handle another post-9/11-style suspension of doubt about the man in charge; if that happens, America as we know it will soon be gone.